There’s a footwear revolution quietly afoot in New York City. Feit, a luxury shoe company that rightly puts materials, design and construction at pride of place, recently opened a second boutique in the West Village to accompany its first store just opposite the New Museum in Nolita. On the west side, Feit’s inviting, petite space has been filled with a timber installation by the artist/designer Jordana Maisie. Created in collaboration with Feit’s founder Tull Price, the structure is made from thinly milled planks of wood that have been digitally cut into precise shapes and assembled in layers to create unexpected sightlines throughout the store. Display areas, views of the street and a service desk have all been poetically carved out of the negative space where the wooden architecture ends. 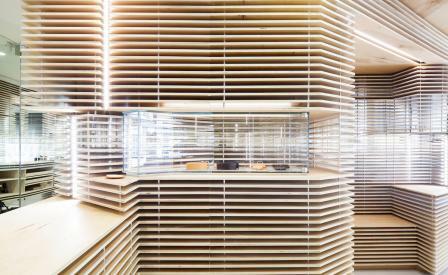 The immersive environment is the perfect complement to Feit’s sophisticated and beautifully made wares. Each shoe has truly been handmade, with hand-stitched lasts and uppers applied to buttery vegetable-tanned leathers to produce a smooth, unadorned finish. The androgynous styles, which are available for both men and women, combine a wearable, everyday aesthetic with a subtle, but undeniable hint of luxury. From loafers and elegant lace-ups to more hardy high-top boots and a range of smaller leather goods, it will be hard to leave empty handed.